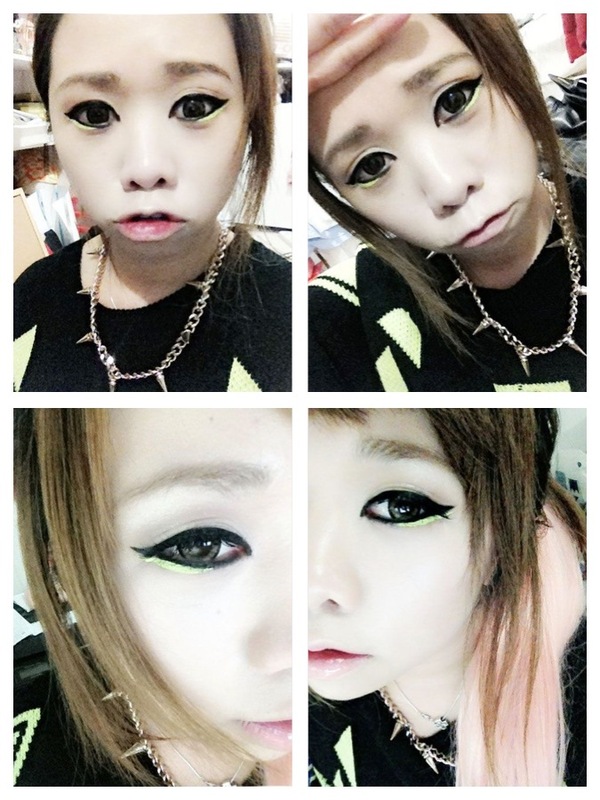 Kpop- 2NE1 Park Bom Inspi. 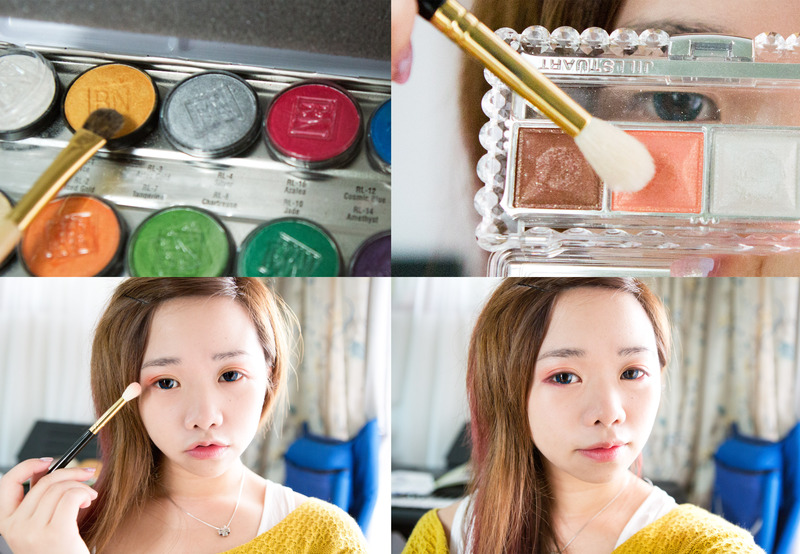 Eye Makeup tutorial! Hello everyone! How’s it going? Today I bought a sweater which reminded me of korean pop culture… and naturally I was wondering what sort of look would look super awesome- wearable but also out there! 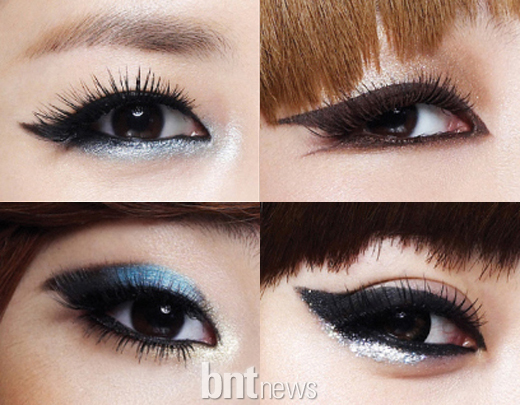 So I quickly browsed through my stash of makeup photos and found 2Ne1’s eye makeup… and really liked Bom’s super liner. 1. As usual, start off with a nice’n’lovely clean face. 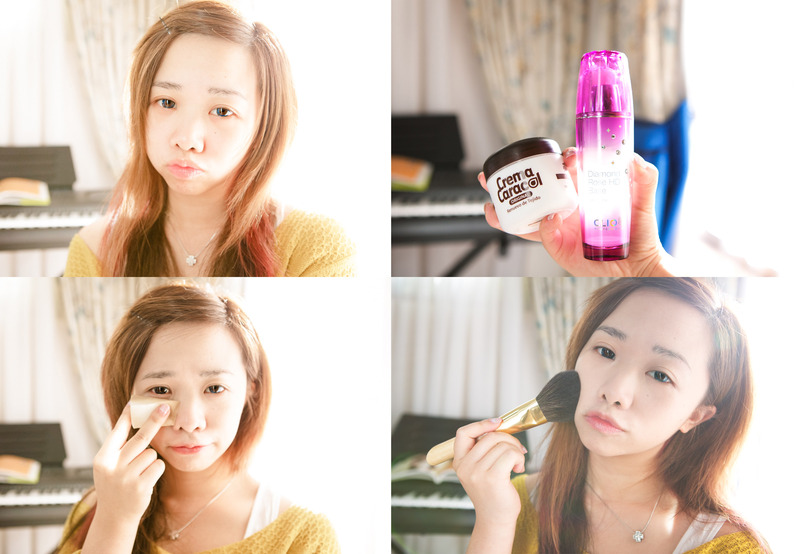 Apply your moisturiser, primer, concealer and bb cream/ cc cream/ foundation. Make sure its slightly lighter than your skin colour…coz korean k-popstars have really pale skin! Today I used cc cream :] I’m still seeing if it will have any effect on my skin over the next few days so stay tuned for the review! 2. 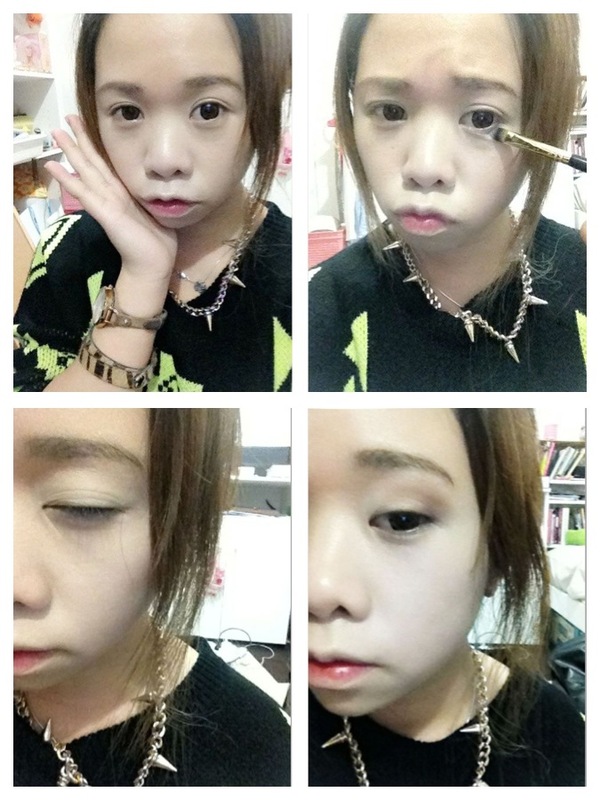 Prime the entire eyelids and under eye area! 3. 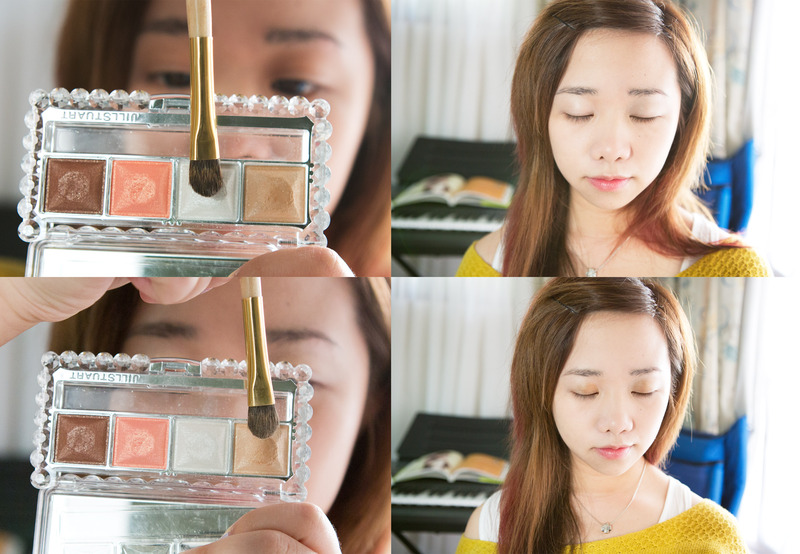 Apply with a light hand, a matte white eye shadow over your entire lid. 4. Take a taupe and buff it into the hollows of your eye sockets and outer v. For people with a flat face shape like me or zero eye hollows this will really make a huge difference! It’ll define your eyes and give it more dimension! 5. Moving on to the eyes, use a bit of scotch tape and tape it diagonally to how angled you want your super flick to be. 6. Start lining! 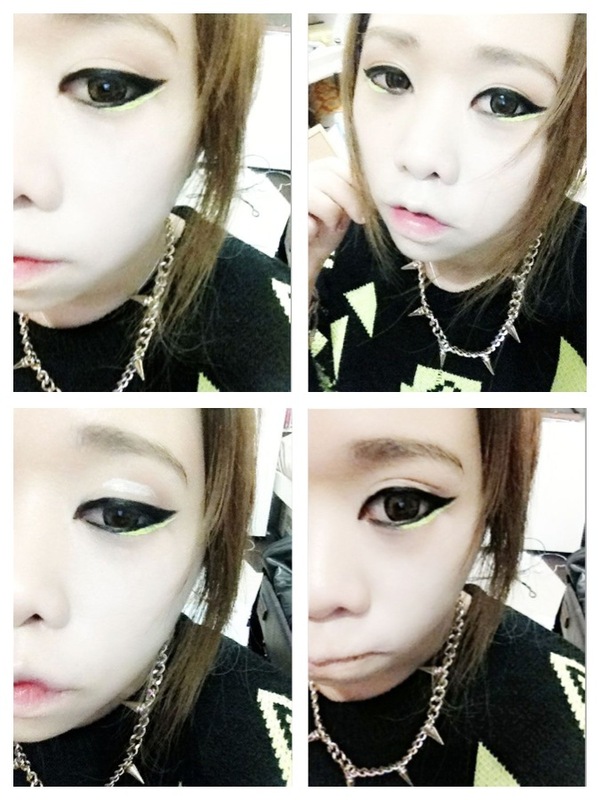 First extend a gel liner with an angled brush to however long you want the liner to be. 7. From the tip of the liner, connect it with a straight line all the way down to your tearducts. 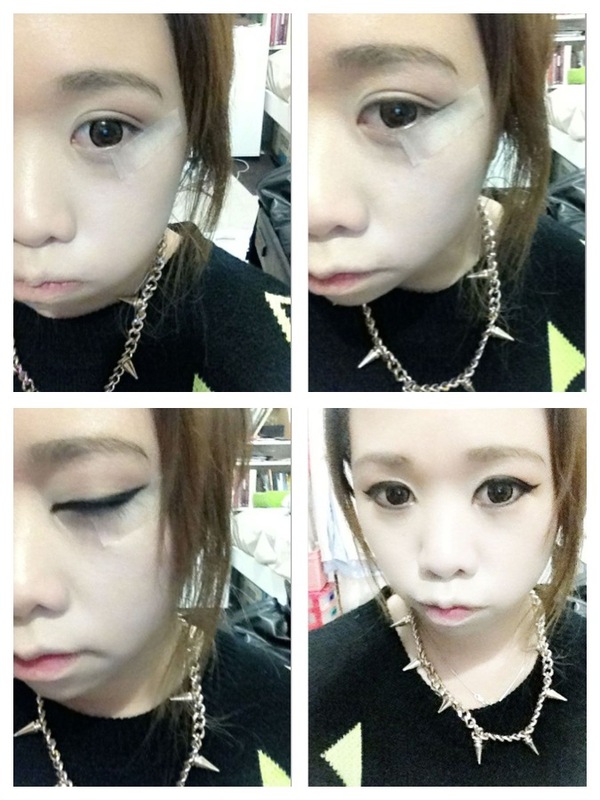 Also~ Make a tip at your tearducts~ Remove the tape. 8. And line your whole water line~ then patch up the areas where you need to re-apply foundation etc. 9. Because I actually didn’t think my gel liner was dark enough I went over with a crayon liner and then sharpened the edges with a liquid liner. What to do from now, take a coloured liquid liner (and if you don’t have one, a coloured eye liner or any really pigmented eyeshadow will do) dab a fine line right below the liner! 10. So.. you’ll end up with a little something like this after completing both sides. 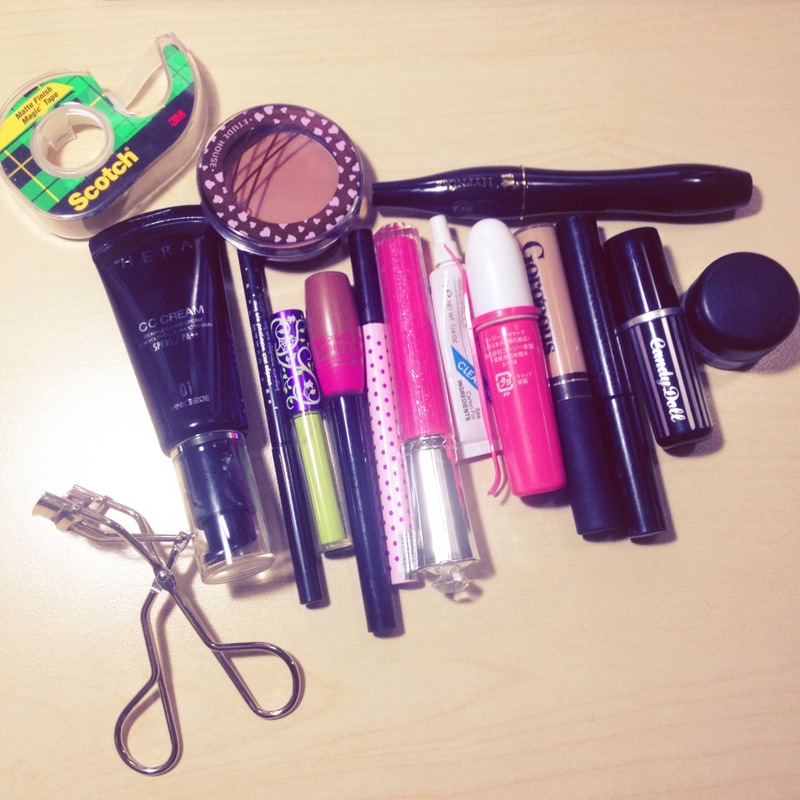 Clean up any messy bits with a Q-tip and liquid liner. 11. 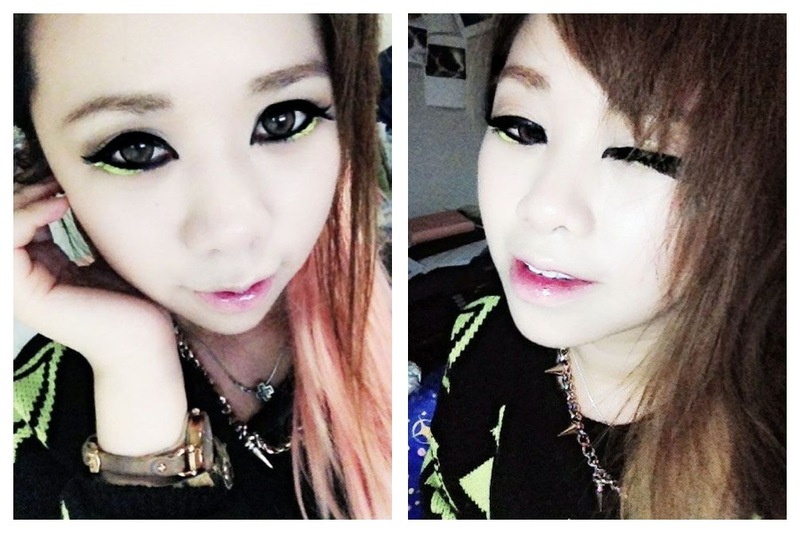 Bom has really big double eyelids so for this look I had to make mine bigger as well using eye glue. You can use tape if you wish but… I prefer glue 🙂 works better for my eyes~ Create a ‘pod’ like shape with the glue and let it dry. 12. And create your double eyelids! 14. Almost done! Now, fill in your brows, curl lashes and mascara! Doneee! LOL sorry for all the selfies… couldn’t help myself D: ily. Now for the stuff i’ve used. *skipped the moisturiser and primer n stuff like that. -Scotch tape, Hera CC cream in 01, Etude House face color corset in #5, Stila smudge stick waterproof eyeliner, Dollywink eyeliner in black, Gorgeous concealer in medium neutral, Pronance lipgloss in PK4, Duo eyelash adhesive, Eyebrow specialist eyebrow mascara in brown, Lime Crime uniliner in citreuse, Eyetalk eyelid glue, Lancome Hypnose mascara, Cyber Colors megacurl mascara, CandyDoll lipstick in 1C. 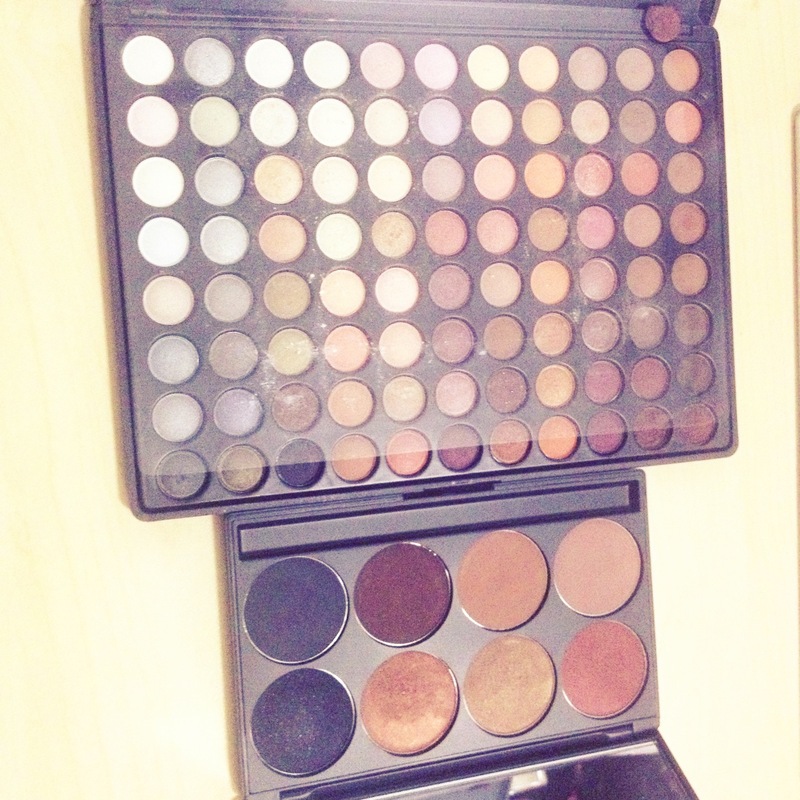 -Coastal scents Warm Palette with 88 eyeshadow colours, Gorgeous essential shades palette. 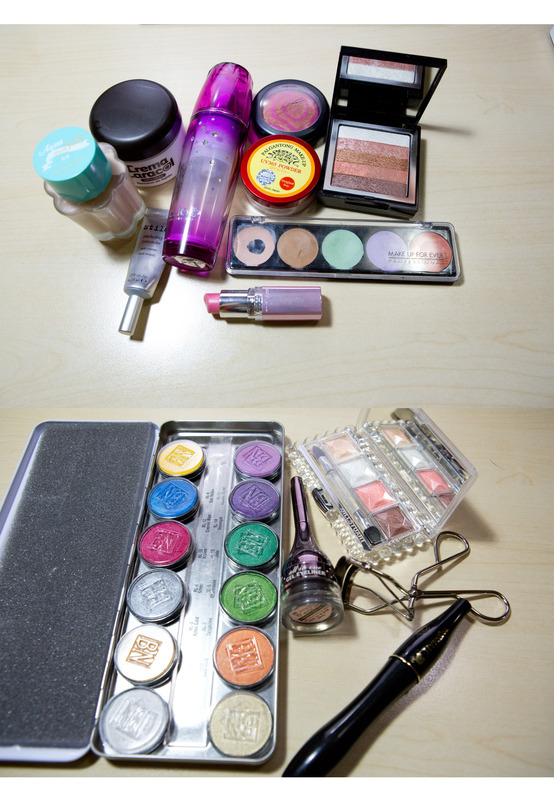 -Dollywink lashes in no.11, Tony Moly Shimmer Lover Cube in Pink Holic, It’s Skin power 10 formula in VC effector. Hope you guys enjoyed the look! Take care!